Pretty good with a camera? Here are 19 Work From Home Photography Jobs that can pay you for taking pictures. Getting paid to take pictures has always been a hard field to succeed in, and it’s no different online. There is a huge market for pictures, but it is extremely competitive. But don’t let this discourage you if you have the talent you can make a pretty good living online just by posting your photos for sale. Most of the sites on this list allow you to post your photos on their site, where people can then purchase them for use. But there’s a few sites and possibility of getting exclusive jobs with buyers that are more long-term guaranteed work. Getting paid to take your own pictures won’t be easy, but it is possible. If you’d like to learn how you can promote your pictures on your own website, visit My #1 Recommendation, I made over $13,000 last month and what you learn could take your photography business to the next level! I won’t jabber anymore. 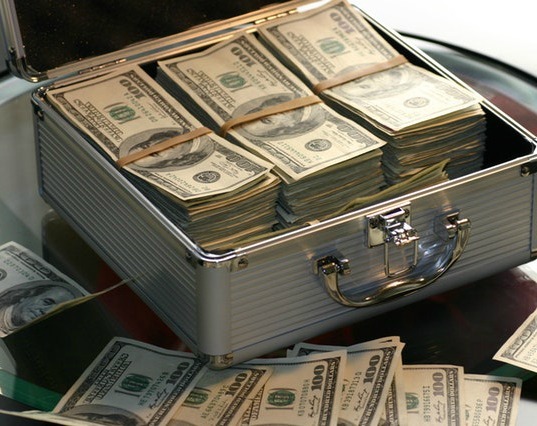 Here are 19 sites that will pay you to post photos online for sale. One of the most popular sites to get paid to take pictures. It’s completely free to join, but you will need to get approved to upload photos. Your images can be sold per download and exclusive license. Rates paid are pretty good for the industry. They do have a high $100 cash out amount, but make payment on time! A perfect site for people looking to make money online with their photos. A pretty popular site that will pay you to upload your photos. You will need to apply, and all photos are approved by 123 Royalty Free. You will receive 60% of the purchase price per download which is pretty good for the industry. Photographers seem to be pretty happy with this site. Big Stock is a site that requires members to purchase credits to make most purchases. For these purchase, they pay $.50 per download. They also pay 30% for purchases made without credits (PayPal, Credit Card). They do offer extended licenses for your pictures and will pay up to $29.70 per sale. Rates are okay, but members seem to be very happy with this site! Pays as a per image download rate. From what I can see around 60% of the sale price. But they do offer an adult pictures section for you people involved in that this might be a good site for you. They also have a referral program where you earn $5 for every photographer you refer that sells 50 photos. This is a really cool app that lets you take photos on your phone and then upload them for sale. All photos are approved before they can be sold. It looks like they sell the photos for $10 and you will get paid $5 of that. Users seem to be very happy with this app. A site that you apply for, if accepted, they will send you specific photography assignments. Requires you to upload seven photos for review. From what I can see payment depends on the size of the project, but members seem to be pretty happy with this site. One of the higher paying sites. They are very selective on who gets in and what pictures they will approve but will pay 85% for full royalty free licenses and 70% for standard royalty-free license. Pretty good site that doesn’t have many complaints that I can find. A site that you will have to apply for. If accepted you will be given a photographer level. This is going to affect what pay grade you’re at, and level can change based on your photos and sales! A pretty popular site that pays you per download for your images. Pay grade depends on how many photos you’ve uploaded and sales since joining CreStock. The more sales you make, the higher you will be paid per download. A site that hires you to do shoots around the world. This is a perfect site for people who travel a lot. If accepted you will be given projects to complete based on where you are located. From what I can see shoots usually pay around $50-$100 and maybe more for bigger projects. Another site that hires photographers to take pictures at locations throughout the US. They pay per project, and it does require you to be able to travel to the location on our own. Seem to always be hiring, but work is limited. Is a site that hires all levels of photographers. Openings are going to be dependent on your location because the work you will be doing is taking photos of homes and commercial property for sale in your area. Now this is 100% a location-based site. Pr Photos only accepts celebrity photos so if you live somewhere with a lot of celebrities this might be a perfect site for you. Could not find much information about payment, but I’d say it has to do with the star and what quality the photo is. Another mobile app that will pay you to take photos with your phone. Seems to be a place where you just post photos for sale and get paid on a per download basis. Another site that is pretty popular. If accepted you can upload your images for sale on their site. You will get paid 50% of the sale price for every photo that is downloaded. Easy site to get accepted to. Will pay 70% of the selling price of your photo. Seems to be a growing site, but at this time not as popular as some sites so other sites may be a better option. A site that rewards their most successful photographers the most. But you can upload your pictures for sale and will be paid on a per download basis. Pricing all depends on what level photographer you are and past sales and uploads with Fotolia. A site where you can upload your pictures for sale. Says they pay up to 50% commission on all downloads. The cool thing is they have a few partner sites that your photos will also be added to for sale. A site that allows you to upload your photos for purchase. Will pay up to 70% of purchase price for full royalty free license and lower rates for other licenses. There’s a $100 cash out amount and payments are made by Direct Deposit. Does have an affiliate program where you can refer your friends. There you have 19 Work From Home Photography Jobs. Overall all these sites on this list are completely legit and a pretty good join. I’d say the ones I prefer over others are ShutterStock and 123 Royalty Free, but you may prefer other sites. One thing to keep in mind is that these sites aren’t going to give you a huge income unless you become extremely successful. It’s a very competitive field; it’s not as easy as just posting some photos and making a bunch of money for them. But it can be a good source of income if you put out high-quality photos that people are looking for! If you’re struggling to make money selling your photos, your best bet might be selling your photos on your own website. Make sure to check out My #1 Recommendation, I made over $13,000 last month online and it can help you promote your pictures! Thank you for reading. 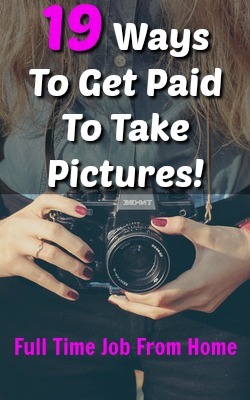 Hopefully, you could find at least one site that you would like to get paid to take pictures with. If not check out some of my other work from home jobs or extra income sites. Uploaded Photos On One Of These Sites? Have another good site to get paid to take pictures? Let me know your thoughts in the comment section below!